Swerve designed a broad line of digital and travel accessories for the brand, working with suppliers to engineer parts and bring the designs to market. We also designed and developed a number of packaging solutions and graphic layouts. 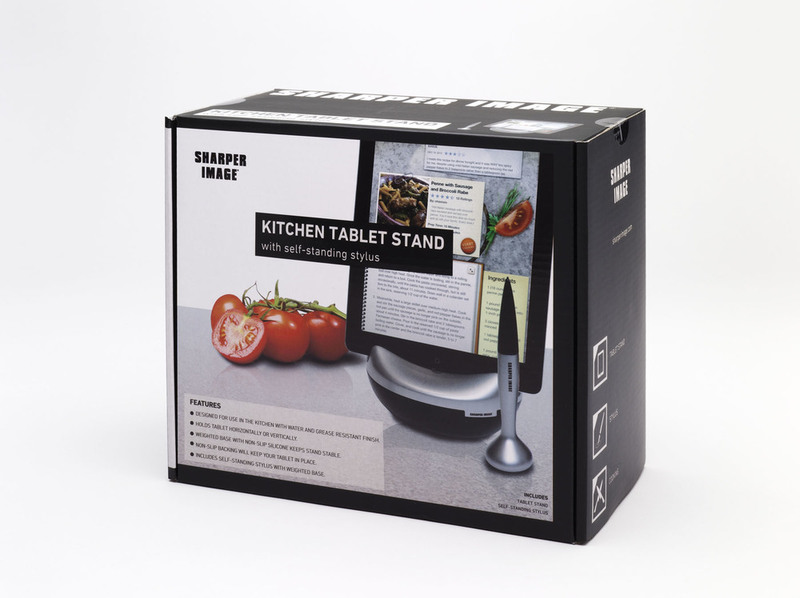 Swerve created three new products for the Sharper Image kitchen line. All three products addressed the increased use of iPads and e-readers for recipes and reference when preparing food. The forms we created are very organic and elevate the readers up from the prep surface, keeping them clean and visible. Each stand comes with a washable stylus for use when hands become messy, one self-standing using a weighted base, the other with a compact pocket-like holder. The third product is a charging base, presenting the user with four usb ports with rubberized covers. The unit is designed to fit in the space at the back of a work surface and the organic form shares the aesthetics of the stand products. In addition to designing and engineering each of the products, Swerve created a set of structural packaging and evolved the branding, building upon the clean and informative style of Sharper Image to inform and showcase the products at shelf.